Wanna see history in the making? 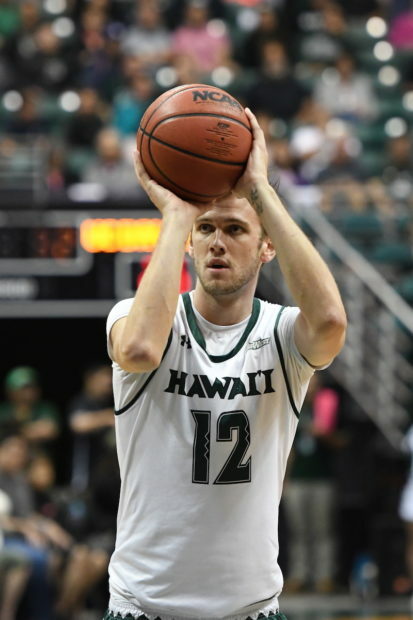 Shoot over to the Stan Sheriff Center this Thursday and Saturday, and you’ll see the most prolific 3-point shooter in University of Hawai’i basketball history. Jack Purchase, a 6-foot-9 senior forward from Australia, is one 3-pointer away from tying the UH career record for 3-pointers. In 83 career games (so far) dating to the 2016-17 season, Purchase has 179 3-pointers. The current record is 180 set by Zane Johnson from 2010-12. Purchase should be at the top of the list by week’s end. The Rainbow Warriors host Cal Poly on Thursday, then UC Riverside on Saturday. Purchase already owns the career record for 3-point attempts, currently at 493. The previous mark was 471, set by Predrag Savovic from 1999-2002. In summary, Purchase likes to shoot the 3, and he’s very good at it. This season, he is 57 for 152 from 3-point range. He is the only player in UH history to make at least 50 3-pointers in three different seasons. What’s more, Purchase is having his best overall season in his UH career. He is currently averaging career-bests for points (11.6) and rebounds (5.8), and has made at least one 3-pointer in 22 of 23 games this season. Purchase is also shooting 84.4 percent on free throws this season, and has a career free throw percentage of .805. That would have a chance to rank in UH’s career top 10 as well, but he will likely not have enough free throw attempts to qualify for the list. When: Thursday, February 14, 7:00 p.m.
First Hawaiian Bank is the sponsor of Thursday’s “Valentine’s Night” game. Carnation flowers will be passed to the first 200 ladies. Register for the First Hawaiian Bank halftime contest at Gate A for the chance to win an Echo Smart Speaker and gifts cards. Fans are encouraged to wear pink for Valentines Day. Underrated player for this basketball team over the past 3 years. His toughness on the inside (defensively and rebounding) plus his outside shooting, and more recently this year his mid-range shot, and his great passing for a big man have all made him the perfect stretch 4 mold for the Eran Ganot team. Thankful for all that he’s done, and hopefully he can cap it off with this shooting record as well as a BWC Tourney championship.